VetArk ARKVITS 50g | Livefood UK Ltd. This is a broad spectrum high-potency multivitamin and trace element mixture for general supplementation of foods particularly for large more adult reptiles. ARKVITS is a blend of NUTROBAL and ACE-HIGH (2:1) to provide a ready palatable source of essential vitamins and calcium. It is suitable for routine use. 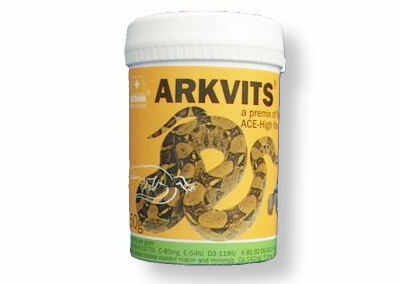 It provides a calcium:phosphorus ratio of 30:1 suitable for maintenance of adult reptiles enhanced with vitamins A,C and E. ARKVITS is suitable also for sprinkling onto food for reptiles and amphibia, including adult tortoises. Because it is a high potency product the actual quantity of powder required to achieve adequate levels of intake is reduced when compared to the products formulated as general purpose multivitamins by other companies. This overcomes the palatability problems which can be encountered when supplementing these difficult animals. We recommend the use of ARKVITS when a general multivitamin is wanted for adult animals rather than one for young growing animals or those with special requirements.